This recipe is super easy, super quick, super healthy, and super yummy (any other “supers” I could add??). 😉 This was a last-minute meal, as I had forgotten to take anything out of the freezer to defrost before work this morning, and I fell out of the meal-planning habit because I had been so sick over the weekend. Fish is the easiest to defrost (run under cold water for 2-4mins and you’re good to go). Fish often doesn’t “need” a recipe…a lot of people have go-to spices, breading, or ways to whip it up (oven, skillet, lemon, butter, whatever yours is), but I’ve been out of the habit of cooking fish. 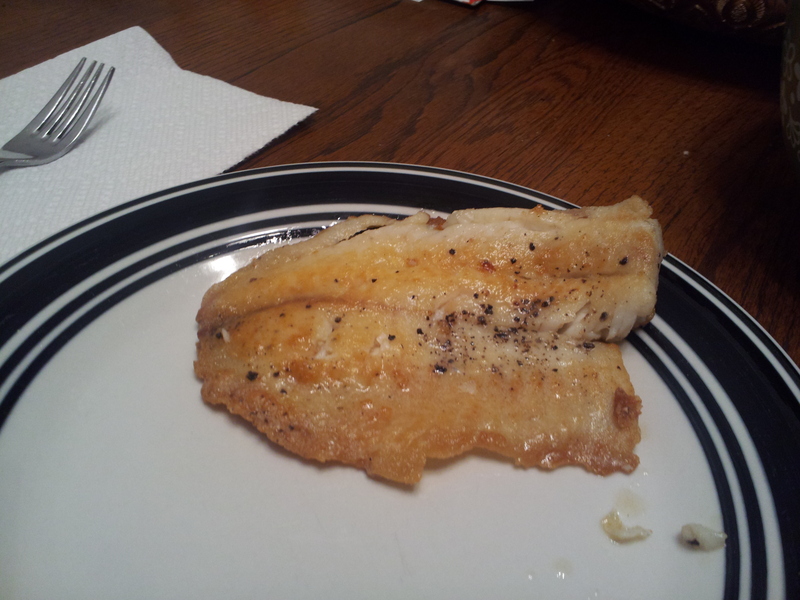 In fact, I don’t think I’ve cooked fish for years (with the exception of last week). I ate fish all the time growing up, my mom made salmon, red snapper, etc. at least once a week while growing up, but I’ve just never cooked it much on my own. Since my husband and I had errands to run tonight, I also needed a quick recipe (baking usually takes 20+ mins). This was PERFECT. It has hardly any ingredients, so almost no prep time, plus, the butter makes it SO GOOD, that you don’t really even need any spices! I paired this with a salad I whipped up–all we had was romaine lettuce and celery, so this was basically the healthiest meal either of us have eaten in quite some time (though we do try to have balanced meals). -Rinse fillets in cold water and pat dry. Season with salt and pepper on both sides. Put the flour in a shallow dish and press fillets into it on both sides, then shake off any excess flour. -Heat olive oil in a skillet on medium-high and cook fillets until fish is able to easily flake with a fork, about 4-5mins per side. Brush the melted butter over the fillets at the very end, right before serving.